A joint dislocation occurs when an injury forces the bones out of their normal position at a joint. Dislocations of the shoulder, hip, elbow, fingers, ankles, and jaw are common and are usually caused by a fall, blow, or other high-impact injury. When a joint is dislocated, there is usually a noticeable deformity. The dislocated joint will be difficult to move and cause intense pain. It is important to ice the area to reduce swelling, and control any local bleeding. If you suspect that you may have a dislocated joint, seek medical care immediately. With proper treatment, your bones should be returned to their normal position and, after proper rest and rehab, the limb should be back to normal function. The injured joint may, however, be more susceptible to future dislocations afterward. Sometimes, it can be hard to discern a dislocation from a broken bone. Both require immediate medical attention. The FastMed Urgent Care team is available seven days a week, including holidays, to evaluate an injury and help determine whether it is a dislocation, broken bone, or some other type of injury. Make sure you apply ice and keep the joint as immobile as possible until you are seen by our licensed medical staff. Dislocations are labeled according to the joint they affect. Although any joint in the body can be dislocated, common joint dislocations occur in the shoulders, hips, elbows, wrists, ankles, fingers, and knees. As one of your body’s most mobile joints, the shoulder is also one of the most susceptible to injuries. Specifically, an anterior shoulder dislocation, which affects the glenohumeral joint of the shoulder, is the most commonly dislocated joint in the body. Dislocated shoulder symptoms almost always include a deformity that results when the arm bone pops out of the socket. Additional dislocated shoulder symptoms may include numbness, tingling in the neck and arm area, and sometimes shoulder spasms, which increase pain intensity. 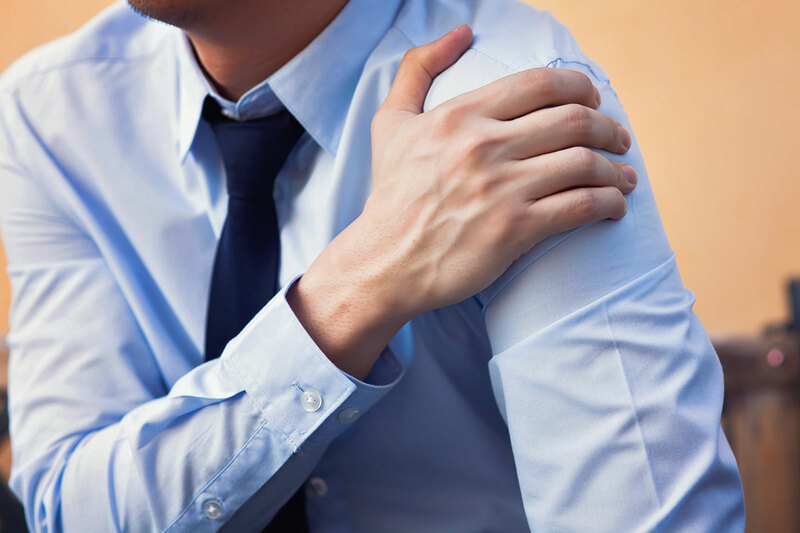 As with any joint dislocation, if you suspect a dislocated shoulder, it is important to have it properly evaluated, which will help you avoid complications later. Ice the area, keep the joint immobilized, and seek immediate medical attention. Your local FastMed Urgent Care can evaluate, diagnose, and recommend appropriate treatment for your injury. Make sure you let our staff know the cause of the injury and the level of your discomfort. You should also inform us about any other potential injuries, about numbness or tingling in the area, or other symptoms you may be experiencing. This will help inform a proper diagnosis. During your visit, an X-ray may be required to confirm a dislocation and to check for other possible damage, such as broken bones and nerve or muscle damage. Gentle maneuvering, known as reduction, may be necessary to work the bones back into proper alignment. Depending on the level of pain you are experiencing, you may be given a muscle relaxant or sedative prior to this process. Once the shoulder is back in its proper position, the healing will begin, and the pain should diminish significantly. After your visit, keep the area immobilized and avoid any type of activity similar to that which caused the injury. Apply ice for 20-minute intervals every two hours for the first few days, then switch to heat. You may be advised to wear a splint or sling to keep the area immobilized. A pain reliever or muscle relaxant may also help keep you comfortable as your shoulder heals. Your FastMed provider may recommend physical therapy for your dislocated shoulder. This will speed recovery by increasing your range of movement. Although you should feel relief as soon as your shoulder is properly realigned, full rehab for a dislocated shoulder can take up to a year. As with most physical rehabilitation, the goal of dislocated shoulder rehab is to gradually increase the joint’s range of movement without pain. Most dislocations are accompanied by intense pain. If you experience extreme discomfort and difficulty moving the joint, a dislocation may well be the cause. To lessen your pain, your FastMed provider may prescribe a muscle relaxant or sedative prior to maneuvering the dislocated bones back into place. Muscle relaxants and pain medications may also help to relieve discomfort as the joint heals. After the initial healing phase, rehabilitation of the joint should help restore it to normal functioning. Your FastMed provider can refer you to a qualified physical therapist for rehabilitation. With proper care and exercise, you should regain full function of your joint within a few weeks. Full rehab, however, can take up to a year.